A clampdown on ill-gotten and unexplained wealth obtained by individuals involved in money laundering, crime and other illicit dealings has come into effect following the amendment of Statutory Instrument 246 of 2018 Money Laundering and Proceeds of Crime and Exchange Control Act by President Emmerson Mnangagwa. A move around some of the northern suburbs of Harare might leave one mistaken to think that the houses there are somewhere in Beverly Hills, America where the well-to-do Americans reside. This is because of the spacious mansions and expensive properties built there with the top of the range vehicles parked outside despite a difficult economic environment that the country has undergone over the years. The government will require owners of properties and assets to explain the source of their possessions following the amendment of the Money Laundering and Proceeds of Crime Act today. "The act was long overdue because any property owner has to establish how they acquired their wealth against their incomes and establish whether they have paid all the necessary taxes," said Mr Tich Zinyemba, a legal analyst. Zimbabwe over the years became a favourable destination of proceeds of crime and illicit dealings such as externalisation of minerals, human and drug trafficking and other various forms of money laundering and it is high time the government makes individuals accountable for the source of their wealth after years of allegations of corruption including among public office bearers. "It is of paramount importance to give confidence in the people that government is walking the talk in fighting corruption. The new law provides for those who have been accused in the past of stealing from government and using the proceeds to build big properties, as well as foreigners who come to Zimbabwe after being involved in crimes, to properly come clean on their wealth," said Dr Gift Mugano, an economic analyst. 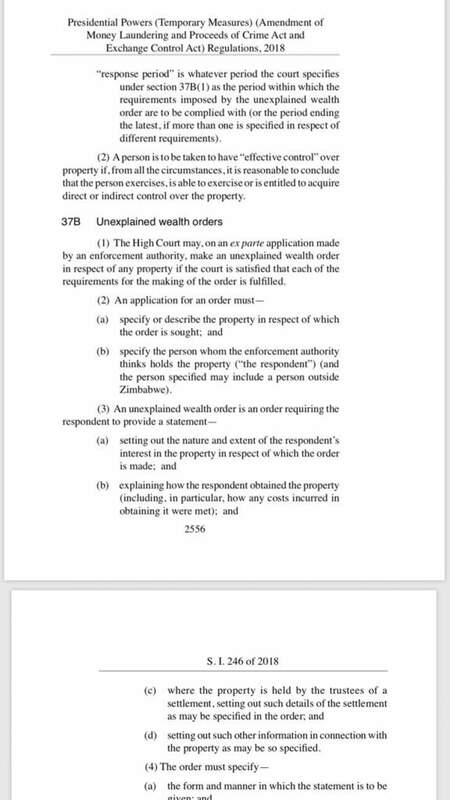 The amendment of the act requires the Zimbabwe Anti-Corruption Commission (ZACC), the National Prosecuting Authority (NPA), the Zimbabwe Republic Police (ZRP) or the Zimbabwe Revenue Authority (ZIMRA) to make an application of unexplained wealth order in respect of any property in possession of suspicious persons in the country. "It will be up to the law enforcement authorities, otherwise the law becomes just a talk. Many people have accumulated unexplained wealth and are known but the government needs to demonstrate its seriousness in making that happen," a retail analyst, Mr Denford Mutashu said. Illegal foreign currency dealers with fat bank accounts are also targets of the new law. Many countries have in place laws that prosecute money launderers and also confiscate any wealth that is not explained by its owners. The amendment of the act will see the establishment of the asset management unit at the Reserve Bank of Zimbabwe with the powers to keep in custody assets or ill-gotten wealth or even sell and liquidate the proceeds of ill-gotten wealth. The successful enforcement of the act will go a long way in making the country an attractive investment destination and public confidence in the fight against corruption.